Have you ever been to a celebration where the cake has been covered in beautiful sugar flowers and have you secretly wished that you could make those flowers yourself? With the right tuition, you can learn how to make sugar flowers easily at home without going on courses that cost a considerable amount of money. You need to be shown how to make them, spend time practicing, then there is no reason why you can’t produce beautiful flowers like an expert. Making sugar flowers at home is not that difficult, however, people often give up because they see how they are made, try to make just one, and they can’t understand why they are not perfect the first time. If you are keen to learn and willing to put in the work to become a sugar artist then practice will pay off, and you will have a fantastic hobby or a new career that will be very rewarding so read on to find out why the best place to start making them is at home. There are several ways beginners can learn how to make sugar flowers. You can attend courses which can last for several weeks, a few days or one day. Courses – where you have to attend physically. There are a lot of courses on offer ranging from the local adult education service – usually run in the winter months where you have to go out in the dark evenings when the weather is terrible, to ones offered for example by TV or internet personalities that are enormously expensive and may be held over several days, so that travel expenses, hotel accommodation, restaurant bills and time away from home needs to be taken into consideration. The downside to any course is that you will be shown once and you will make an item once and unless you take copious notes by the time you get home chances are that you will have forgotten how you made it with all the excitement going on at the time. I know this to be true from personal experience when I was learning and also when I have taught courses because the following week the first thing I had to do was go over the previous lesson because the students had forgotten a lot of the essential techniques they needed to know before we could move on to the next flower. Books – I find that books are great for getting ideas from but actually learning how to make gum paste sugar flowers from a book is not always easy because they never seem to answer all my questions and with many, not the full instructions are given, so you end up guessing what some of the steps are. Don’t get me wrong, I love my books, and I have around 20 of them by famous cake artists that I often browse through for inspiration but beyond using one of their favorite cake recipes I didn’t find them very helpful for making the flowers. Videos – this is my favorite way of learning because you are able to see how a flower or leaf is made and you have the ability to rewind the video to repeat the steps as many times as you like until you get it right. However, I find that a lot of videos are not clear enough to learn from. I prefer videos that have been filmed over the instructor’s shoulder so you can see exactly how the flower is being made and you can repeat the steps as many times as you like until you get it right. Sugar flowers are made of sugar gum paste. It is made using confectioners/icing sugar mixed with several ingredients including edible gum such as gum tragacanth or CMC (sometimes called Tylose or Gum-tex which are trade names), to make a sugar paste that can be rolled very thinly and worked with tools into lifelike leaves and petals. Most of the flowers and leaves are made using wires to support them and to enable them to be made into sprays that can be placed on a cake. If you search the internet for sugar flowers you will also be given information about gum paste flowers. If you search for gum paste then sugar paste also appears. Why? Are sugar paste and gum paste the same? Yes, sugar paste and gum paste are the same. It can be confusing because different people call it by different names. It is also known as sugar gum paste, sugar gum paste or gum paste. Which is the best homemade or store-bought gum paste? There are many makes of ready-made gum paste or powder that you mix with water to make gum paste, you can buy and over the years, and I have tried many different brands. I have never had much success with them as they are sticky to use, they often don’t dry properly, and with some brands, the completed dry flowers break easily. Store bought gum paste is not cheap to buy, and if you need a large quantity of it for a project, it is cheaper to make your own. Having said that, it is usually down to personal preference, and you will only find that out by trying them out yourself. It also is down to what climate you are in when making your flowers as the atmosphere can have an effect on what you produce. You can make gum paste with a stand mixer or by hand. If you make it with a mixer you will need to use a tabletop stand mixer because it is a very stiff dough. A hand mixer is not strong enough to cope with it, and the motor will more than likely burn out. If you don’t have a tabletop stand mixer, then it is better to make it by hand. The only difference is that the paste made with a machine is whiter than the one made by hand, but you can always knead in some white gel food color to the already made paste. Don’t use liquid color as it will alter the texture of the gum paste and you will not be able to use it to make flowers. I prefer to use Sugarflair gel colors but I am sure other makes are equally as good. You can buy gel colors at your local cake decorating supply shop, at Amazon or from any online cake decorating suppliers. You will find the recipe I have always used for homemade gum paste here. Do you know the difference between gum paste and fondant and do you know which one you can use to cover a cake and which one you can’t? What’s the difference between gum paste and fondant? Gum paste/sugar paste is made from icing/confectioners sugar with ingredients such as gum added to it to make a pliable dough that can be rolled and stretched very thinly. It is used to make flowers, leaves and other delicate decorations for a cake. When dry it becomes very hard so you cannot use gum paste to cover a cake. Fondant is made from icing/confectioners sugar into a dough that ingredients such as gelatine have been added. It is a much softer dough than gum paste, and it is used to cover a cake. When it dries, it will crust but stays soft enough to be able to cut the cake easily. You can find the easy recipe for fondant here. Now you’ve found out how to make sugar flowers and what to make them with you will need some tools to work the gum paste to shape the flowers. What tools do I need to make sugar flowers? After my first lesson on making sugar flowers, I realized that I had absolutely nothing to make them with. I went to a college to learn, and everything was there that I needed to use. My tutor gave each of us some gum paste and said go home and practice. I had no tools, no cutters, absolutely nothing and not the slightest idea where to buy anything from but this was over 30 years ago, and there was nothing like a cake supplier near where I lived, and there was no “online”. That’s when I started to hunt around my kitchen drawers to find some things that I could use. I found a child’s small rolling pin and board – which I sanded smooth, around handled teaspoon which made a good ball tool for stretching out petals as well as a sharp knife to cut out leaves and petals and I practiced. The flowers and leaves were not as perfect as the ones cut out with proper cutters, but in nature often flowers and leaves are not perfect. I made a flower that certainly was not perfect, but I was proud to show it to my tutor at the following lesson. 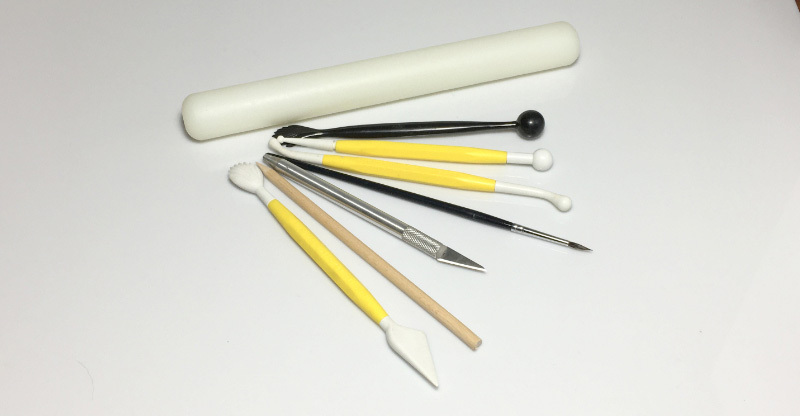 Of course, nowadays getting supplies for gum paste flower making is easy but I think it’s not a good idea to pay a lot of money out for a lot of tools before you start making flowers, just get some basic ones and add to them as you need them. Modeling tools – a few basic tools will be enough to start with, and they are not expensive. However, if you want to spend a little more money then a set of 8 will give you all the tools you need to start. A small non-stick flower paste rolling pin, three stretching ball tools, a paint brush, a craft knife, a wooden dowel, and one shell and knife tool for veining are some of the tools you will need. Small non-stick rolling pin and board – if you have a non-stick board you roll pastry on you could use that at first. Edible glue – such a gum arabic or you could use beaten egg white to start, but although it keeps for a couple of days in the fridge, it is very wasteful as you will never use it all unless you have a large project. Once mixed with a little water Gum Arabic will keep for a couple of weeks in the fridge. It comes in powder form and if you keep it sealed then it will last for ages. Gel paste colors – when you first start you can just make white flowers from the gum paste, but I am sure you will soon want to make some colored ones. To color your gum paste, you must use gel paste colors because if you use a liquid color it will alter the consistency of the paste and it will not make good flowers. 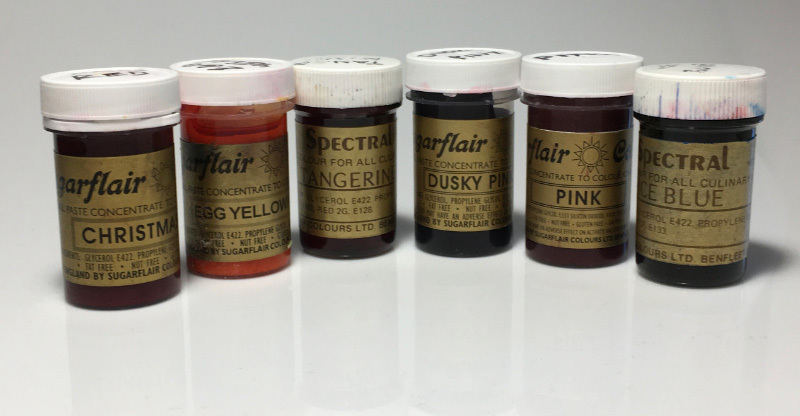 I use gel colors by Sugarflair, but there are quite a lot of makes available, wherever you live, that you can buy from your local cake decorating supplier or from an online store. Deciding where you will make the flowers is the next step. Where can I make sugar flowers? Having a place where you can put all your equipment, leave it out and go back to it whenever you get the urge to make flowers would be ideal, but very few of us have that luxury. When deciding where to make sugar flowers, you must remember that you will be using icing/confectioners sugar and cornflour so no matter how careful you are there will always be some of it around. If you haven’t got a place you can shut yourself away from everyone, using your kitchen is the logical place to work but you need a shelf or a box to store your tools and equipment, etc. if you don’t want it hanging around all the time. Also, buy some airtight plastic boxes to store your finished projects. At first, you won’t need very much space to work, a corner of your kitchen table or an area on your worktop will do, but I do advise sitting down to work as it takes time and will be very tiring if you stand for that length of time. Of course, as you get more and more into making the sugar flowers, you will need more drying and storage room. Then, of course, you will want to make cakes to put them on so you will need space away from children and pets where you can work and store everything. Once you have decided where to make your flowers and you will need to buy some petal and leaf cutters. The best flowers to start with are roses and blossoms because by learning how to make those you will learn a lot of basic techniques that you will use to make many other flowers. 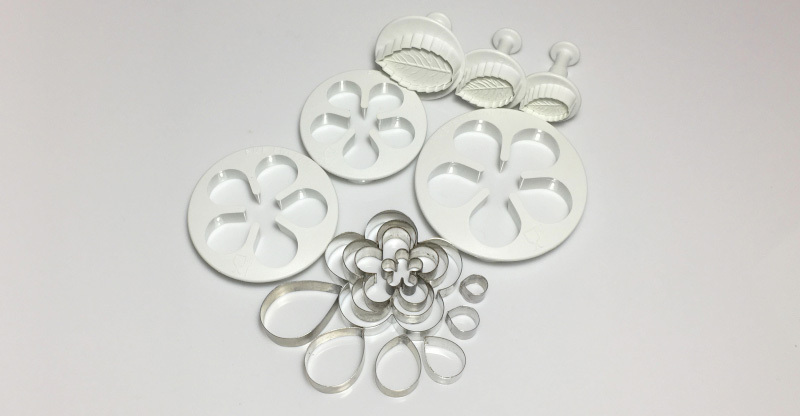 You will need to purchase some rose petal cutters, leaf cutters and also some blossom cutters but first of all, decide by what method you will learn and buy the cutters recommended for the first lesson. 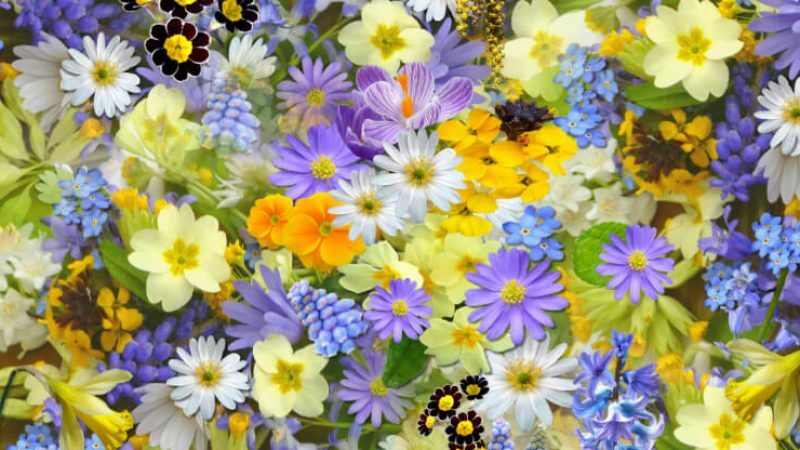 It is much easier to make flowers with cutters because each flower you produce will be the same size. When you first start making flowers, it is best to use cutters to cut out flowers and leaves while you perfect all the techniques. When you have mastered that stage and gained experience, then you may wish to go further with this art form and learn how to make them without cutters. Making flowers and leaves without cutters is possible. However, it takes a lot of skill to be able to master the art, and as I said previously, I wouldn’t recommend that you start off learning how to make gum paste sugar flowers this way. You will have to learn techniques on how to produce the same sized petals and leaves by judging them by “eye” rather than having a cutter to cut out the perfect shapes and sizes. 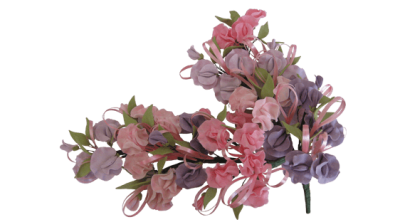 When you have learned how to make flowers and leaves using cutters, are confident in producing them and can make perfect flowers that would be the time to extend your knowledge as a sugar flower artist and learn how to make them without cutters yourself or find a tutor who can help you. Now you know about all the things you will need to make gum paste sugar flowers I can highly recommend the Sugar Flowers Workshop video. I have made a video course called Roses and Blossoms which gives instructions for a vast amount of techniques that are needed to make many of the sugar flowers. When you have learned how to make the flowers on the video, you will know enough to be able to make the flowers for your first wedding cake or any celebration cake. On the videos, you can see over my shoulder exactly how to make the flowers and the leaves, how to mount them on wires and then how to assemble them into sprays and place them on a cake. Because the videos have been filmed over my shoulder, you can follow my every move just as if you are in the room with me. You can rewind the videos as many times as you like so you can see exactly how the flowers are made. If you are still not sure how a technique has been carried out, the videos have been split into chapters so you can go back to any part of making the flowers and see it again. With the course comers instructions on exactly what tools and materials you will need for each flower. I hope this article has given you an insight into how easy it is to make sugar flowers at home. I have explained what the different tools and materials are that you will need to buy and have given you links to some recipes. Also, I have given you some information on my Roses and Blossoms video course which is perfect for beginners. All you need to do now is choose how you would like to learn this art and set yourself up with some necessary equipment. Follow the instructions and put in plenty of practice and you will discover how talented you are and it will give you hours of pleasure and may even give you a new career.